see below further details on the themes discussed. markets in relation to Brexit headwinds. Russia and Turkey may follow different trends as was the case in 2018.
than in the previous decade. In some sectors, CEE became the manufacturing arm of Western Europe with FDI gradually changing its scope to focus on more advanced industries, increasingly involving also the service sector. Poland) with 2019-20 being the most important years in terms of the absorption of the funds. had a higher speed of convergence in the last years. Lending growth is expected to be rather strong in the CEE banking sector in 2019, around 4-4.5 per cent (CEE excl. products and delivery still has some space for growth for CEE banks. situation in terms of credit quality is not comparable to the past (NPL ratio moved from 14 per cent in 2014 to 5 per cent in 2018 on average for CEE excl. Turkey and Russia). higher than the use of internet for online purchases in the region. low levels of 2015-16 and in 2019 it is expected to make up two thirds of the revenues in the CEE banking sector. improved asset quality – lower NPL translating into lower LLPs – has been the main driver of profitability in the last years: the profitability for CEE markets has been constantly growing year on year in 2013-17. The return on equity, for instance, is currently around 10 per cent at the banking system level (CEE excl. TK and RU) and is expected to remain at such levels. highly liquid and characterised by a high level of competitiveness across all jurisdictions. With our solid leadership position and strong commitment to the region, UniCredit will continue to support the economic growth of the CEE markets in which we operate. 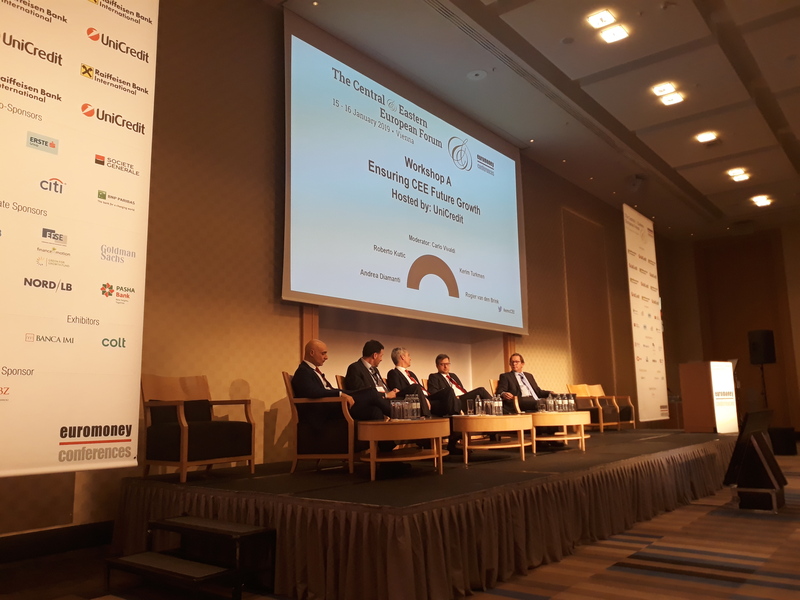 The CEE division is and will continue to be the core growth engine of the Group,” said Carlo Vivaldi, Head of CEE Division at UniCredit at the annual Euromoney Forum. constantly improve customer experience have become one of the most important areas for companies to invest in. Head of CEE CIB and PB at UniCredit. privatisations in certain countries (i.e. Slovenia and Serbia). continued strong client growth in 2018. We are the largest lender in the CEE region (EUR 64.2 billion7) with 11.7 percent market share in lending and solid growth in the last 5 years. UniCredit is ranked as #1 in CEE overall in terms of total assets, and in the top 5 in most individual CEE countries10”, said Carlo Vivaldi, Head of CEE Division at UniCredit. end of 2019. The quality of the portfolio is also improving, with the ratio of gross NPEs reduced by 229 basis points (to 6.5 per cent) in 9M18 when compared to 9M17. underlining the strong profitability of the CEE division. Furthermore, mobile banking users are expected to grow from 38.2 per cent of all customers in 3Q2018 to 47 per cent over the next year.